My mother and I decided to go out for a ladies’ lunch today. We chose Cafe Sabarsky based on it’s highly-rated desserts, great reputation and a convenient location. We shared 2 salads and had cappuccinos and a piece of cake for dessert. The salads were presented simply, but elegantly. Everything tasted quite good, but to be honest, for the cost, they were pretty tiny portions. We asked for a basket of bread, which helped to turn our appetizer sized salads into a more complete meal. The bread was wonderful, and without it, we would have been left hungry. 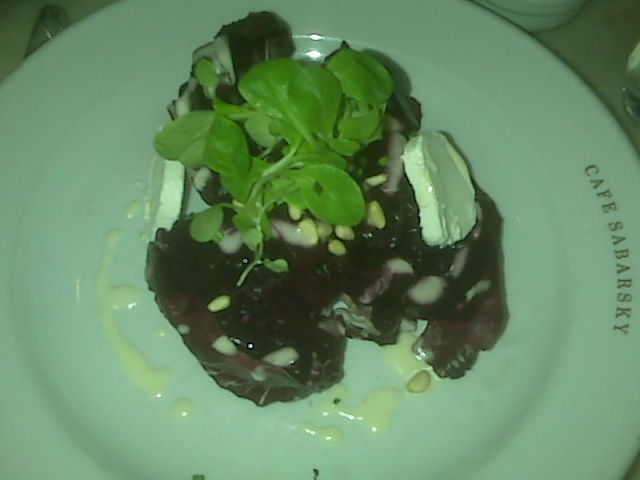 (which, after a $50 lunch seems a bit unforgivable) The beets with pines nuts and goat cheese were just that. No bed of lettuce to bulk things up. The cheese was of wonderful quality, but again, not much of it. 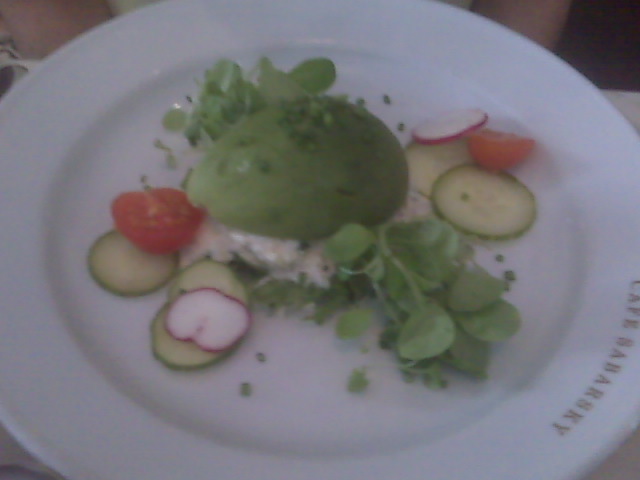 The crab meat salad included a few slices of radish and cucumber and half an avocado. The crab was light and delicious, but doused in too much mayo. The basil vinaigrette was wonderful and I wouldn’t have turned down a bottle to go home with- but they didn’t sell it. 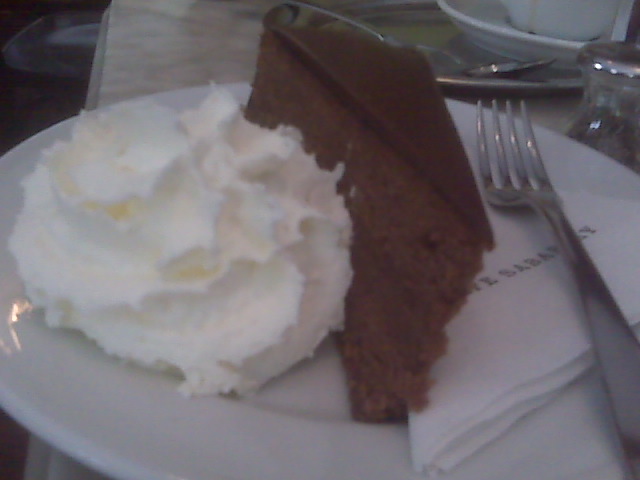 The best part, without question, was the chocolate apricot cake with fresh whipped cream. The waiter told us that was the most popular choice on the (very appealing) dessert menu and that made a difficult decision much easier. It was not dense and heavy- although it looked that way. It had a decedent chocolate ganache layer on top, but underneath was a relatively light chocolate cake. The apricot was almost undetectable…but once every few bites I would get a little aftertaste of it- very nice. The homemade whipped cream on the side hit the spot. The setting is pretty casual but comfortable. Make sure you sit facing the windows for the best vantage point. Overall, I’d totally suggest stopping in for a coffee drink and some dessert, but skip the overpriced, under portioned lunch.